The Swiss charging station maker EVTEC is currently testing the much awaited longer range 2019 Nissan Leaf as we can see in the tweet below. The company shows us that the 2019 Nissan Leaf is able to reach a fast charging rate of 102 kW at the SoC (State-of-Charge) of 32 %. No more #rapidgate in this much awaited new model year. It’s obvious that the 2018 Nissan Leaf is just a stopgap electric car, until the 2019 model year finally arrives. The Nissan Leaf is probably the most reliable car on the market and if we exclude the above average battery degradation problem due to the lack of a TMS (Thermal Management System) it’s almost flawless. Now the upcoming 2019 Nissan Leaf promises to be even better. I’m looking forward to it. I am looking forward to a Nissan Leaf with a decent range and no overheating batteries. It’s interesting. But for me i think the current 40kWh version is enough, although i’m still a bit skeptical about the passive cooling of the batteries and also the price is a bit high. Do you think the price will come down when this 2019 model comes out? It’s very likely that Nissan starts discounting the 40 kWh when the 60 kWh version release gets near. From all the statements and information about the Leaf this larger battery model is not a replacement model but an additional one. It will likely be more expensive but not as expensive as the larger battery Kona EV. A lot of people are talking about the 40kWh Leaf being replaced and that is definitely not what I have read from Nissan. Will make a great taxi with the longer range battery in 2019 and have been surprised to see taxis in Dublin with the first generation Nissan Leaf and now the 2018 i thought they would have waited till 2019 to get decent range. The statement that the Nissan LEAF is the probably the most reliable car on the market is interesting. In my opinion the car is a of great design and function, but the battery degradation on most LEAF’s is pretty bad, around 4% a year or even more, and now there are many older LEAF’s that have severely limited range, having lost up to a third of their capacity. I have one myself and wouldn’t say that the car is reliable in light of such issues affecting the actual usefulness of the car. Definitely Brandon, battery degradation is very important (even from an environmental point of view), but at least is predictable. When I think about electric car reliability I think mostly in those things that can leave you stranded on the road without notice, like a motor or on-board charger failure. This kind of things seem to be rarer in the Leaf than in most other mainstream electric cars. So it is even charging at 202kW?!? That’s photoshopped. The real charging rate is 102 kW. Interesting, but where do you find a 100 kW CHAdeMo charger? For Europe the car needs CCS, I only have heard of 150 kW CCS chargers not of any CHAdeMo with more than 50 kW. The first two article do only state that 150 kW and higher chargers are being build, but not if they are CHAdeMO or CCS, I think they are CCS. The last article states the new CHAdeMO standard and that it has been tested, but not that any of the new 150 kW or higher CHAdeMO chargers are installed any place in Europe. The chargers are at the manufacturers, ready to be sold. 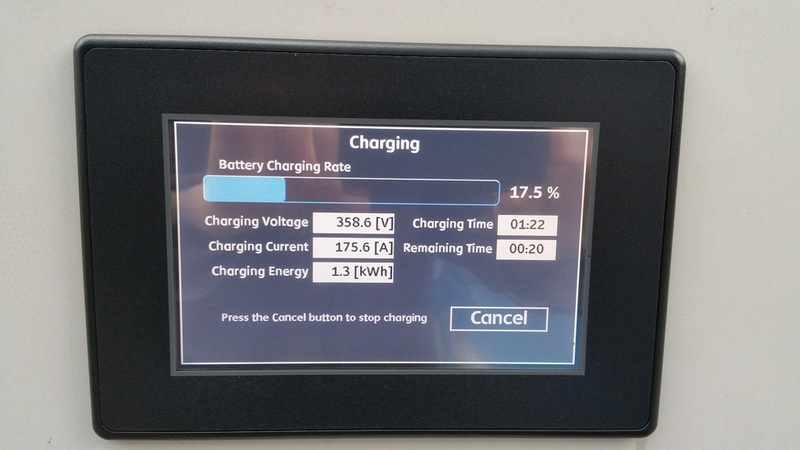 Also to upgrade the exisiting 100+ kW chargers with new cables so they can provide the power through CHAdeMO tconnector oo. ChaDeMo right now supports up to 400kW. That is what the new standard supports, have you seen any CHAdeMO charges that can charge with more than 50 kW, I haven’t. When do you think the 2019 LEAF will be officially unveiled, and, more importantly, go on sale..? I just signed the purchase contract for KONA on Saturday. And I don’t think I’ll come to think it was a terrible choice. But the 2019 LEAF might also have been an excellent option. For me, it came down to just itching for a longer-range EV and wanting to know that I will have it by next summer. Although it isn’t clear exactly when I can get the KONA – the delivery estimate was just Q2, 2019. Obviously I would love to get it in April. Even the first half of May would be fine. But it might be late June. So depending on what the delivery situation for this new LEAF turns out to be in Norway, it is actually possible that I can buy the new LEAF before I’ve received my KONA (that I reserved in June 2017) – or could, if I hadn’t committed to buying a KONA. Making things sillier, I still have my Model 3 reservation. That one was made in March 2016. And, if I want a base model (no prices known in Norway yet), I guess Tesla might be able to deliver that maybe a year after Hyundai delivered the KONA and I could have bought the 60 kWh LEAF. I think I’ll hang on to the reservation just to see when things happen, but it would take a lot at this point for me to actually buy the thing. I really don’t know when Nissan plans to unveil it, but I think it will be later this year. The 2018 model year was first on sale in Japan, but it’s possible that the 2019 model year will arrive first to the USA, where current sales are very low and it needs to compete with the Tesla Model 3 and the Chevrolet Bolt EV. Sadly the 2019 Leaf we all dreamed of seems to be vaporware. Nissan recently announced that the 2019s will be the same price and the same (obsolete) drive train as the 2018s….